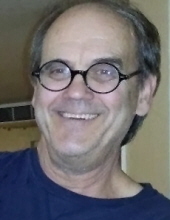 Stephen James Ellis, 68, of Iowa City, died Wednesday, November 28 at his home surrounded by family. Visitation will be from 5 pm to 7 pm on December 6th at Lensing Funeral & Cremation Service, Iowa City. Memorial services will be at 2 pm on Friday, December 7th at Lensing Funeral & Cremation Service, Iowa City with the Very Reverend Rudolph Juarez officiating. A reception to follow at 4 pm at The First Avenue Club (1550 S. 1st Avenue, Iowa City). In lieu of flowers, Steve’s family requests memorials be directed toward Iowa City Hospice and the American Cancer Society. Steve was born March 5, 1950 in Iowa City, the son of Quintin Roosevelt and Bernice Ann Ford Ellis. He was raised in Coralville, Iowa and graduated from Iowa City High School in 1968. Steve received his Associate of Arts Degree from Kirkwood Community College in Cedar Rapids, Iowa. Steve spent his career painting and hanging wallpaper with Pat Harding Construction and later owned his own business, Detweiler- Ellis Wallcovering, retiring in 2012. Steve was a musician most of his life playing in bands such as the Downbeats, We the People, Uncle and the Anteaters and The Morning After. During the 1980’s, The Morning After was named the “Best Band in Iowa” and invited to play at the Grand Ole Opry in Nashville, TN. Steve was a two-time inductee into the 2009 class of the Iowa Rock n’ Roll Hall of Fame. Steve was an avid collector of beer memorabilia and traveled to various breweriana shows throughout the Midwest. Steve was always a loyal Hawkeye fan. He was also known for making his “world famous” beef jerky. Steve is survived by his wife, Ann Hamilton; son, Alexander (Melissa) Ellis and daughter, Kerri (Andy) Fischels; sisters Christy (Terry) Huntzinger and Terry (Don) Rhoades; his brother Rick Ellis and several nieces and nephews. Steve was a loving and proud grandfather to Elliott and Oliver Ellis. He is also survived by his cats Big Babo and Ebony. He was preceded in death by his parents, Quintin and Bernice Ellis. To send flowers or a remembrance gift to the family of Stephen Ellis, please visit our Tribute Store. "Email Address" would like to share the life celebration of Stephen Ellis. Click on the "link" to go to share a favorite memory or leave a condolence message for the family.